A career in engineering is interesting and fun. It involves a lifetime of continuous learning to adapt to changes in society and the natural world. It’s important to find a career that you can enjoy as well as it provides Variety of Career opportunities. Engineering is such a vast field where you have so many options to choose as your career as per your interest. Engineering Study have lots of challenging work as well as financial security because if you can grasp knowledge very well then you can get the best job. 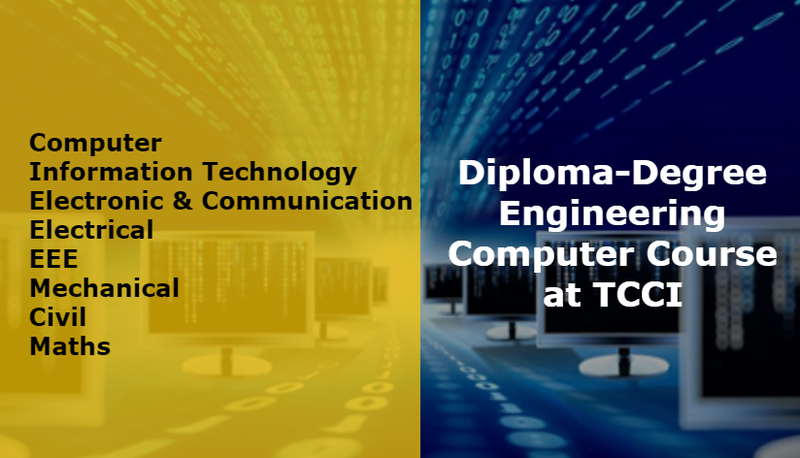 TCCI Coaching Institute provides coaching to the Diploma-Degree Engineering Students including University of Nirma, Indus, Gujarat Technological, GU,DDIT, PDPU, Changa etc. If you want to develop your career in Engineering Branch and want to go in deep to study then you can connect with TCCI Coaching Institute in Ahmedabad. There are coaching available for so many branches in Engineering like Computer, Information Technology, Electronic & Communication, Electrical, EEE, Mechanical, Civil etc. TCCI is located in Bopal and Satellite in Ahmedabad. We have High Qualified and 12 years Experienced Faculty. We have trained more than 150 students till now. Our proficiency lies in identifying your talent, understanding your aptitude, analysing your needs and nurturing you to reach the zenith of technical excellence.